Franz Kafka’s Metamorphosis was published for the first time in 1915, in the October issue of Die Weißen Blätter, so October 2015 is being celebrated worldwide as the 100th anniversary since the appearance of the uncanny story of Gregor Samsa. This also makes 100 years of theoretical tackling of the Metamorphosis, which drew the attention of numerous outstanding philosophers, literary theoreticians and writers of the 20th and 21st century including Alain Badiou, Albert Camus, Alenka Zupančič, Catherine Malabou, Georges Bataille, Gilles Deleuze and Felix Guattari, Giorgio Agamben, Jacques Derrida, Jean-Paul Sartre, Judith Butler, Jorge Luis Borges, Julia Kristeva, Martin Heidegger, Maurice Blanchot, Merab Mamardashvili, Michel Foucault, Mladen Dolar, Slavoj Žižek, Theodor Adorno, Tzvetan Stoyanov, Tzvetan Todorov, Walter Benjamin, etc. Certain paradigmatic interpretations of Kafka’s work forcefully delineate the interpretative fields of the 1960s and 1970s. We might even say that they provide a red thread in discussions regarding the status of the short story and of the space of literature per se. The Sofia Literary Theory Seminar dedicated a year of collective effort to the careful reading of Kafka’s Metamorphosis. 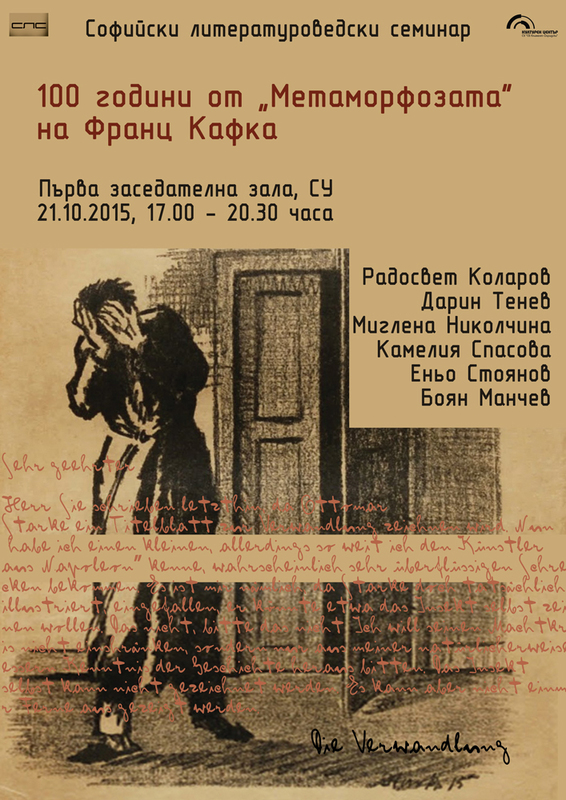 Through the prism of this history, at a colloquium which took place on October 21 at the Sofia University “St. Kl. Ohridski”, its members offered their own perspective to the heterogeneous trends in contemporary debates. Their approach was open to the spheres of philosophy and literature as the grid for analysing Kafka’s work, but also to political science, political economy, sociology, and other areas of thought. Central to the discussion was the concept of metamorphosis in its potential for a constructive approach to the problems of fiction and fictional modelling. A more general wager of the discussion was the question of the status of literary theory today.